This series of houses was developed to give clients of HOME ARCHITECTS ® more bang for their buck. After spending about 2 years designing houses for economy builders through the Great Recession, this architectural company learned what bargain builders were doing to remain successful, even during economically challenging times. It is all about affordable luxury houses. Most people associate HOME ARCHITECTS ® with higher-end luxury house design, and they certainly have many of those accomplished to date. However, the firm also has the ability to design houses of all types and sizes and budgets. HOME ARCHITECTS ® latest state of the art in Affordable Luxury Homes: the Forest Meadow Series (C) Copyright 2011-12, Home Architect, PLLC, All Rights Reserved Worldwide. The company’s Forest Meadow Series is the result of those lessons learned by actual economy builders. But being economical does not mean that there are not luxury features, like wood flooring throughout, wood ceilings, large stainless appliances, over-sized Gourmet Kitchens, screened rear porches with fireplaces, choice of roofing and interior finishes, upscale garage doors, many options, open plan, large kitchen island for your family to gather around, spacious master suites, including oversize tubs and large tile showers, huge windows and much more. There are many features that most people would think as being associated with much more expensive “estate-level” projects. This is a Small to Mid-size Forest Meadow concept Main Level. 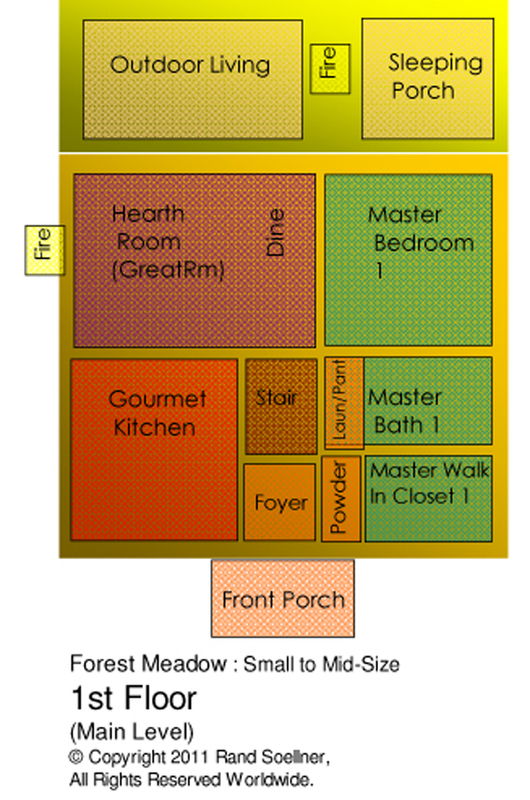 The Main Level is at grade level from the street or entry side/level. 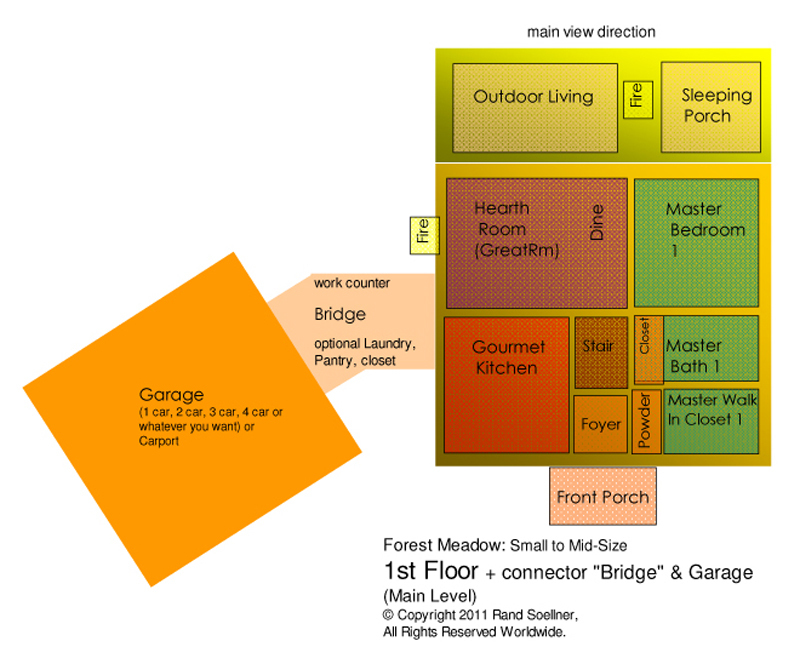 The Main Level (also called the 1st Floor Plan) diagram is to the left. This simple plan can be expanded, in terms of width (left and right), to be virtually any size. The smallest is 32′ wide and so far, the widest has been 68′. However, this architectural company can make it as large as you want. This diagram illustrates one of the more simple and compact arrangements. In the wider sizes, an additional bedroom and bathroom can be added to the main level if you wish, along with an optional bar, larger laundry and pantry, mud room, larger dining and other added spaces. This Plan Diagram is identical to the plan above, although it has had the firm’s unique and effective “Bridge” and Garage added on the left side. HOME ARCHITECTS ® one of a kind Bridge features whatever you want, although many people enjoy the Work Counter with windows facing the view toward the rear, a center circulation aisle, and Pantry, Laundry, sink with counter and storage Closet on the other side. What used to the be Laundry/Pantry inside the main plan often then becomes a central storage closet or second Pantry. The Garage can be 2 car, 3 car, 4 car or whatever you want, even a carport or porte-cochere (covered drive-through near the Front Porch). 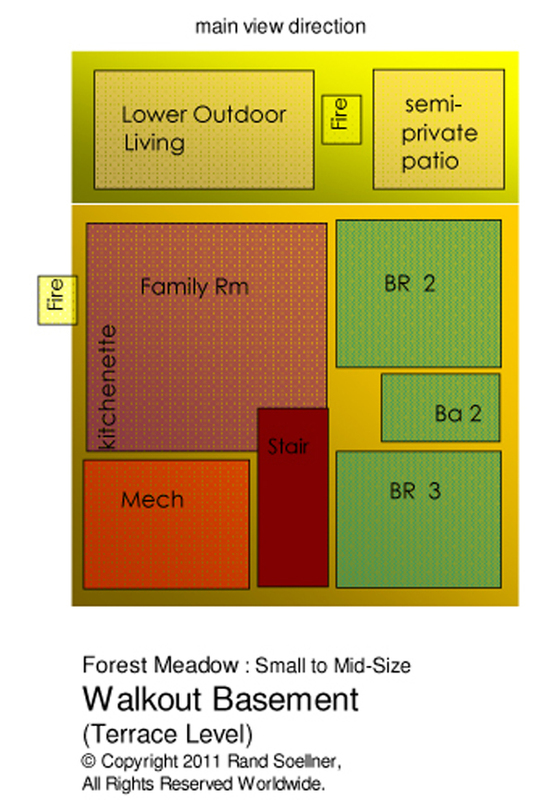 The plan to the left is the Walkout Basement of the Forest Meadow Small to Mid-size, also called the Terrace Level. The main view direction is to the rear, which is “up” on the plans. Features like this can be incorporated into your Forest Meadow Series house, if you want a grander front entrance. (C)Copyright 2004-2012 Home Architect, PLLC, All Rights Reserved Worldwide. Designed by HOME ARCHITECTS ®). There are many variations, including all one story, Loft Levels, full 2nd floors, bonus room options, garages, porte-cochere (fancy carport), a variety of dining options, bars, Family Rooms, Gourmet Kitchens, spacious Pantry-Laundry rooms, elevators, and a new space exclusively developed by the architect: the Bridge. This is an optional space between the Main House and the Garage. It can be a control center for the house, or a breezeway, or a utility room, a Mud Room, or whatever your needs want it to become. This Forest Meadow Series is new, and several versions are presently being developed for clients, so there is not yet built construction photos, but the firm will be updating this page with elevations and other drawings, as development occurs. This is State of the Art in House Design for affordable luxury. APPROACH: HOME ARCHITECTS ® is a custom house design firm. They will meet with you and present concepts for any of the above schemes, then customize that concept tailored to your specific needs, objectives and desires. No two clients are the same. People are unique, and senior staff architect Soellner creates new designs based on the Forest Meadow concept as desired, for each new client. These are not really intended as “plans for sale.” The firm is an architectural design company, programming each client’s goals for each project, then making adjustments to suit. 1. Value and Economy: an architectural house design concept that delivers a tremendous value for the dollar, based on client choices. 2. Flexibility/Scalability: the built-in ability to create 1 story, 2 story, or 3 story houses for clients, of various sizes, from around 1,000 HSF to well over 6,000 HSF. 3. Beauty: these designs are gorgeous. They have been created to allow either an understated Country Farmhouse image, or a full-blown Estate appearance. It is up to you.